Specialist art gallery website design services. SEO Google ranking incl. 20+ years experience. Start showcasing your artworks online. 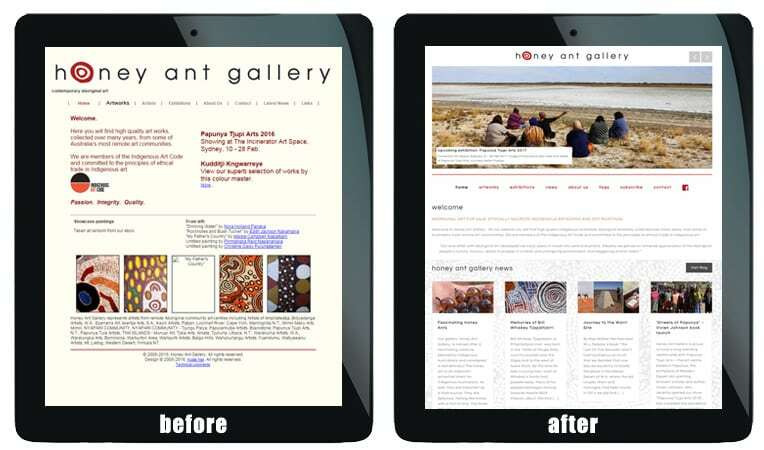 The owners of Aboriginal art gallery, Honey Ant Gallery, already had a website that had been developed many years ago. It was old fashioned, clunky, not mobile-friendly and definitely not optimised for a top Google and search engine ranking. See example of the original website below. I intially worked with gallery owner, Lisa McLaren, when I did a personalised social media training course and Facebook consultancy workshop with her to teach her how to use social media to promote her gallery, exhibitions and increase the galleries exposure. It was during our consultancy session that I encouraged her to consider upgrading her website – not because I wanted extra work, but it would have been a waste of her time to promote the old website which, unfortunately, didn’t adequately represent the artworks for sale and didn’t provide an enjoyable experience for website visitors. Lisa’s brief for the website design brief was a stylish, minimalist and clean layout. Secondly, as Lisa would be updating the website herself, it needed to have built-in content management functionality and an easy system for adding and updating the aboriginal artworks. As with all websites I develop, I did several hours face-to-face training with Lisa showing her how to manage her website and make sure all new information was optmised correctly to achieve the relevant search engine ranking. With hundreds of aboriginal artworks featured on the website, an extensive search facility was required. Visitors can narrow down their search by size, community, artist’s name and whether the artwork can be viewed at their Sydney or Noosa gallery. A search by keyword can also be undertaken. Finally, a blog was added so Lisa could showcase information about aboriginal art news and other topical articles that might interest visitors to the website. These also assist to expand the website’s keyword relevancy. 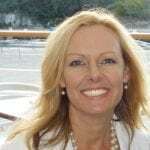 I was absolutely thrilled with the service provided by Rebecca Mitchell of RAM Marketing. She really delivered on the brief and provided an ideal end result. Her attention to detail is excellent, and she is very hard working and responsive, also very patient! I highly recommend her service. – Lisa McLaren, Honey Ant Gallery. 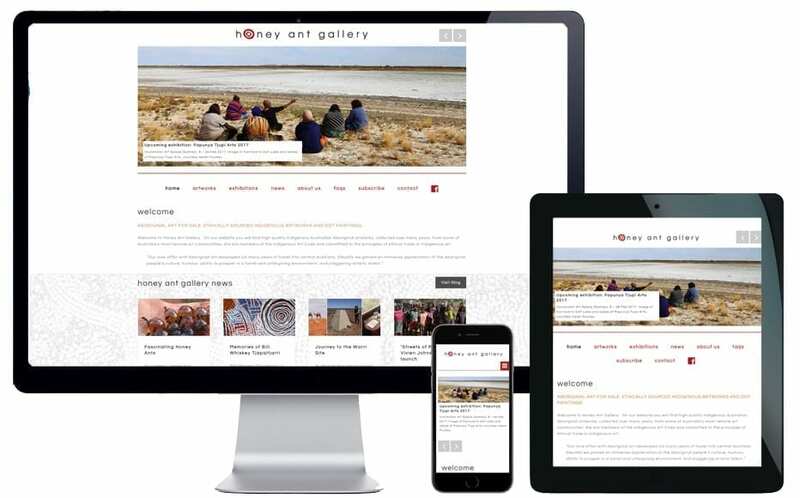 Honey Ant Gallery, an aboriginal art gallery established in 2005, proudly showcases the immense talent of a select group of Aboriginal artists from Australia’s central desert. The website features high quality indigenous Australian Aboriginal artworks, collected over many years, from some of Australia’s most remote art communities. Honey Ant Gallery are members of the Indigenous Art Code and committed to the principles of ethical trade in Indigenous art. If you’re a Sydney art gallery and are looking to enhance your presence online, contact Rebecca Mitchell for obligation free advice. I can assist with the development of new website design, website upgrades, new web design, e-commerce websites, WordPress websites and blogs, search engine optimisation and much more. Ask about my personalised social training courses and search engine marketing services where you learn everything you need to know about promoting your gallery and engaging potential buyers online.